1) Stephen Elop. It’s his second Nokia World, appearing last year. But it’s his first time as CEO (he was technically ‘jobless’ as he mentioned last time. 2) Jo Harlow – EVP, Chief of smartphones. The N9 should already be available by October 26th. New device announcement though: First Windows Phone, possibly the Belle devices that have passed FCC? She is also the 7th Most influential Woman in Wireless for 2011. 3) Mary McDowell – More S40 phones? Mary is in charge of Nokia’s push for the next Billion. 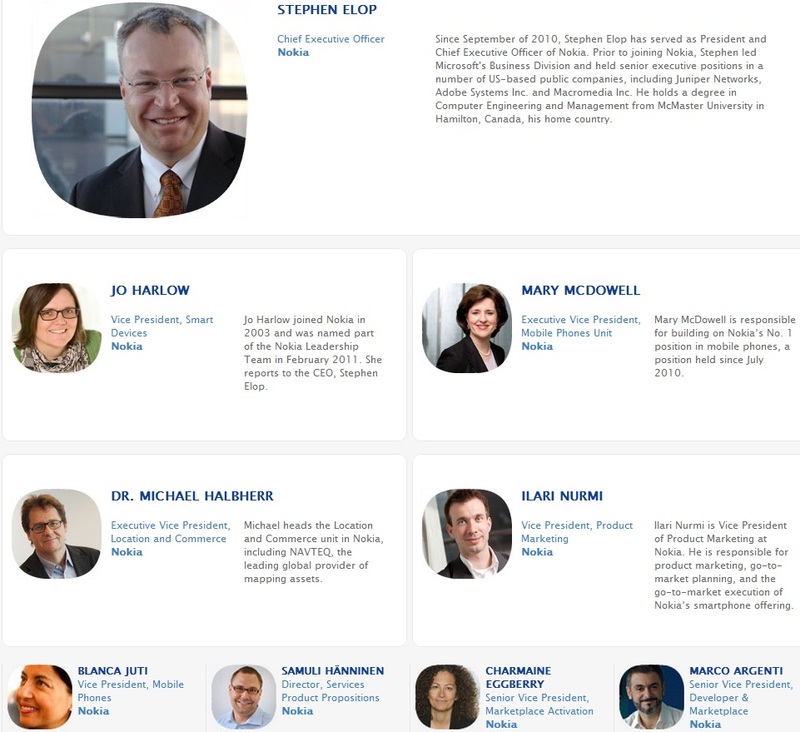 4) Michael Halbherr – looks pretty different here to his photo on Nokia main site. Head of locations and commerce unit including NAVTEQ. I wonder what cool locations/maps stuff we’ll see? 5) Ilari Nurmi – Met Ilari last year when he was head of Eseries. He is now VP Product Marketing. That’s awesome as my Q&A to him was about marketing related stuff. 🙂 His immediate boss then I guess is Ms Jerri DeVard, the EVP and Chief Marketing Officer. 6) Blanci Juty – Head of product Marketing, Nokia Mobile phones, part of the team to enable the next billion to get online. 7) Samuli Hänninen – Product Marketing across Nokia services. 8) Charmain Eggberry – What a cool last name. Ms Eggberry was previously employed by RIM, maker of BlackBerry. 9) Marco Argenti – VP, Developer and Market Place at Nokia. Here’s the agenda. No exact details yet of who is speaking and when. We can guess Mr Elop will start the show (possibly with the awesome Mark Selby hosting). Tip: Attend keynotes for developers. It’s extremely difficult when you just HAVE to be there on the floor getting hands on videos for posting, but if you’re not there to bring news, you might get some freebies. As noted before, the venue is the same as last year. Hotels disappear pretty quick a month before the event. If you know you’re going, book ASAP. Don’t trust the hotel WiFi. Current registration fee is about 695 EUR if done early, 995 EUR after. That’s a bit pricey though I think Open Mobile Summit is something like twice that. Most Nokia related bloggers tend to have a ‘free ticket’ from Nokia. That’s all we know for now. 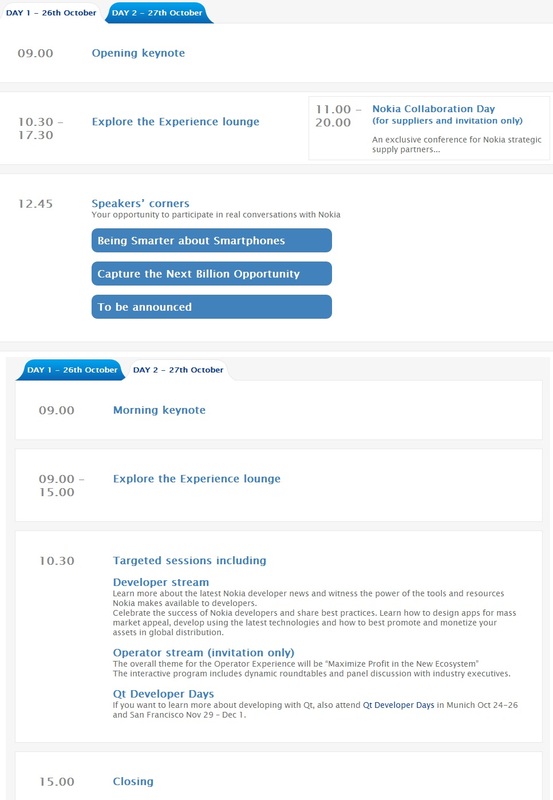 Note the Qt Developer Day in MUNICH (24th – 26TH) which clashes with Nokia World. « 4Squick Foursquare app updated.